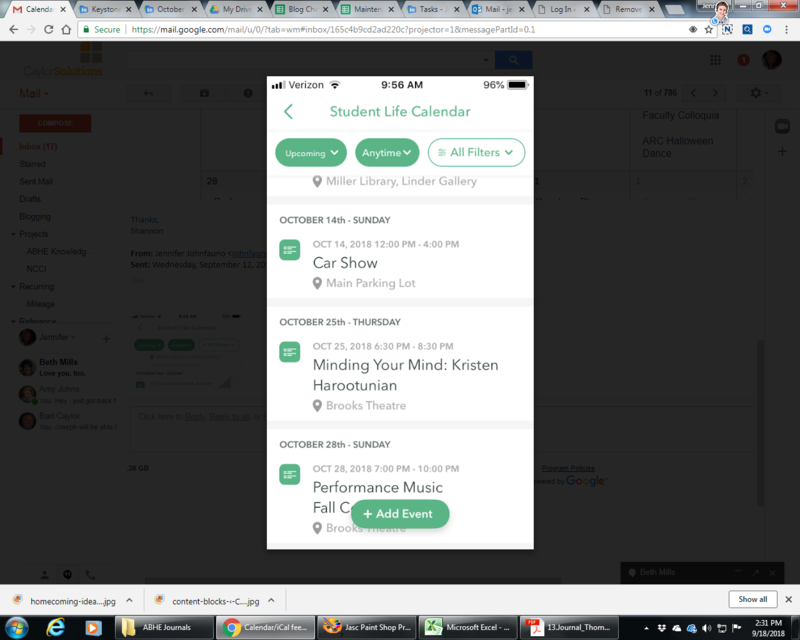 Attached is a screenshot of the student calendar form the app we have on our phone. You can see that there is a Car Show event on the 14th and then nothing until the 25th and then nothing again until the 28th. However, the screenshot of the calendar below shows events on those dates that are missing. Thanks for reaching out. I will try to help with your issue. How are you getting events from your site to the mobile calendar? Can you share the ical url that you are using? 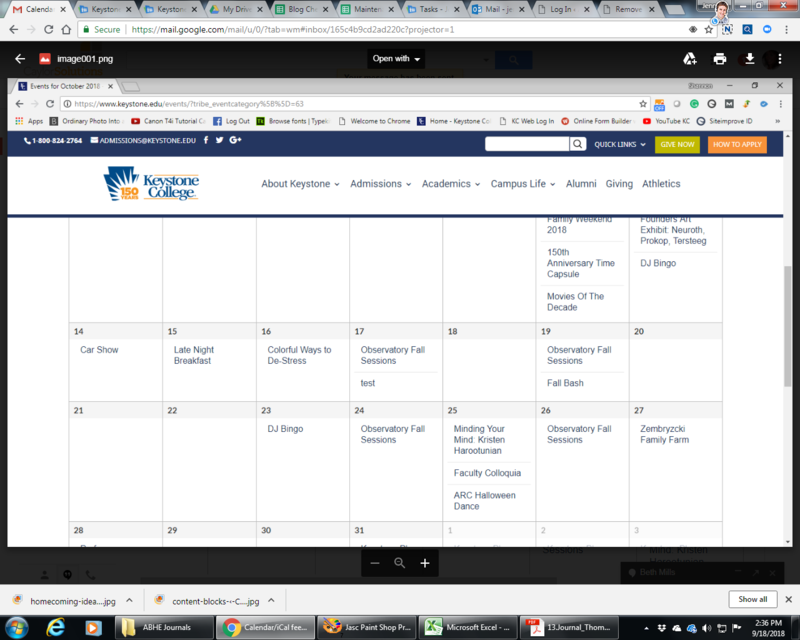 The academic calendar feed seems to work, but it doesn’t pull anything after 2019. But most of those events get added at one time, not on a daily basis like the others. This is the link: https://www.keystone.edu/events/category/academic-dates/list/?ical=1&tribe_display=list. The Student Life calendar is: http://www.keystone.edu/events/category/student-life/list/?ical=1&tribe_display=list. Our athletics uses an RSS feed to pull from their site (which is a different platform) and they have no issues. I took a look at this, and while events seem to be in the actual ics files, they are not imported into Google Calendar via a feed. I’m going to have to dig into this to try and figure out why. In the meantime, can you download the ics file from the ical feed url, and upload it to your other calendar manually? Hi, just checking back in to see if you were able to see what the issue was, thanks! I had another similar issue that I was hoping would yield some results, but we were unable to track down the problem on our side. I see that you are on WP Engine hosting. Can you try something for me? In the WP Engine settings in your WordPress dashboard, can you disable “Object caching,” clear the cache and try to import from the site again? Let me know if that changes anything. I’ll try that now, I’ll let you know the results, thanks! Thanks for checking that for me. We looked deeply into this issue with another customer, and didn’t find anything unusual from our side of things. If you enter the feed address in your browser, and look at the file that is downloaded, the events are there. If you manually import that file into Google calendar, the events will show up. In the other case, the feed url was working fine for Outlook and another third party calendar. This appears to be an issue on Google’s end, being able to access that file on certain sites. To make sure this is all the same in your case, can you try downloading the file from the URL in question, and manually import it into your calendar? Can you also try running through the troubleshooting steps we recommend here? I was able to manually import the calendar correctly. I tried those troubleshooting steps and it didn’t resolve the issue from what I could see. Great! I’m glad you were able to import manually. This is the purpose of the links, and we are not providing a different file or anything if they are accessed by a calendar feed scraper. We haven’t seen any more instances of this issue beyond you and the other customer I referenced. I’m afraid out of suggestions of things to try to resolve this. I’m sorry I wasn’t able to find a solution for you. Please let me know if you have any additional questions about this. The topic ‘Calendar Feed & App Calendar Feed Different’ is closed to new replies.